From a popular blogger and gluten-free vegan cook: a comprehensive guide to making allergy-friendly sweet treats for any diet, complete with options free of refined sugar.Are your food allergies or special diet making it hard to satisfy your sweet tooth? Dessert lovers, take heart: Sweet Eats for All provides creative twists on classic confections for people following all sorts of special diets. Recipes include steadfast staples like German chocolate cake and key lime pie alongside innovative dishes like matcha-cashew ice cream and chocolate butternut pots de creme. You'll also find tips, techniques, and common conversions and substitutions. 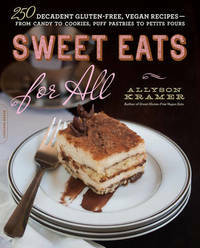 Each gluten-free vegan recipe is clearly labeled as soy-free, nut-free, or corn-free, and the book dedicates an entire chapter to desserts free of refined sugar.